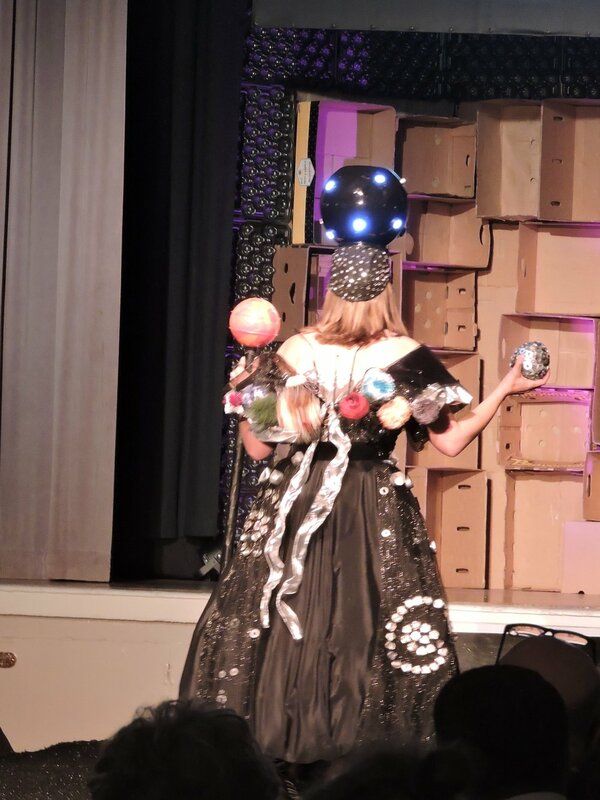 Julia wins award for “Out of this World” design at the Sonoma Community Center’s 9th Annual Trashion Fashion event. It was announced at the Trashion Fashion Wrap up party on April 12th that Julia’s Planetarium design won her award. Her overall concept and ingenuity won big with the judges! The Planetarium dress is on display in the hallway on the 2nd floor at the Sonoma Community Center, located at 276 East Napa St. Sonoma, CA. Congratulations to Julia! Julia is a featured artist in the Sonoma Art Walk for the month of October. The Sonoma Art Walk is part open house and part pop-up gallery tour set up to connect artists and their art with local businesses and the community. The monthly walks are held the first Thursday of the month. Visit www.sonomaartwalk.org. On October 4th Julia did a meet and greet with the public at the Sotheby Real Estate office at 25 E Napa St. in the town of Sonoma. Julia’s art will be on display at the office throughout October. Their office hours are Monday through Friday 8:30 - 5:30 with agents available most Saturdays and Sundays to allow assess to see Julia’s paintings between 10:00 and 5:00. Julia is a juried-in artist of the Arts Guild of Sonoma and regularly presents her paintings, prints, jewelry, and artcards. This month’s show is up through Oct 29th. The Art Guild of Sonoma is located at 140 East Napa St, Sonoma, CA. Hours are: Friday and Saturday 10 AM to 5 PM. and Sun, Mon, Weds, and Thurs 11 AM to 5 PM (closed on Tuesdays). EXPERIENCE THE SHEER JOY AND ENERGY OF JULIA’S GEYSER ART ALONG WITH THE GEYSER’S OWN ENERGY!!!! Don’t miss this opportunity to see Julia’s geyser gown in person! Don’t miss this chance to see Julia’s Copper Geyser Sculptures, wising boxes and bowls! Close up of a miniature geyser sculpture! Go see the Geyser paintings! Watch for the owl! Buy a painting or a print! Owl watching Geyser going off. During the family’s 2017 summer vacation, Julia Pozsgai visited Old Faithful Geyser in Yellowstone National Park. When Julia witnessed Old Faithful geyser erupting, she was smitten. The regularity and sheer energy of this geothermal natural wonder struck something deep in her. She returned to California and was determined to recapture the magic it sparked for her. She painted geysers, designed jewelry with geyser imagery, created mini-sculptures of geysers, included geysers on her sewn ukulele pillows, and applied the theme to her entry in the 2018 Sonoma Community Center’s Trashion Fashion by creating a “Geyser Gown”. Her design went on to tie for third place out of 42 entries. 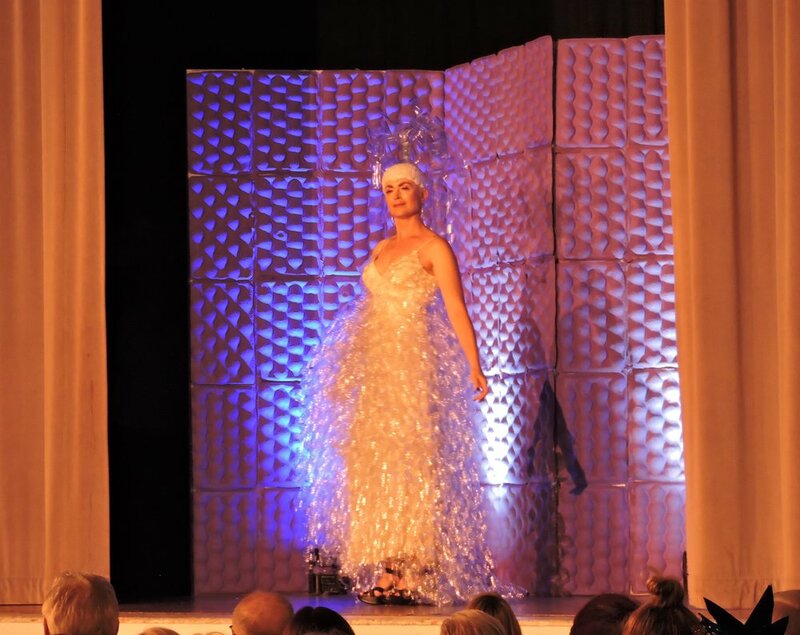 Made of over 400 recycled plastic bottles hand sewn onto a vintage gown along with a matching headpiece that expresses the spewing action of the water and steam of a geyser, this stunning design is worth seeing! The public has an opportunity to experience the geyser and see Julia Pozsgai’s geyser expressions at the Old Faithful Geyser of California in Calistoga, CA September 1st through September 30th. The geyser erupts every 15 to 35 minutes depending on the time of year, reaching from 20 to 80 feet in height with the nuances of weather, sunrises and sunsets creating interesting shapes, rainbows and sprays of delight. Old Faithful Geyser of California is open 7 days a week 8:30 AM to 7:00 PM. There is no cover charge for viewing the art show but the entrance fee into the park and geyser viewing is worth every penny for the chance to witness Old Faithful Geyser of California, along with the museum, gardens, bocce courts, animal farm, and picnic grounds. A “Meet the Artist” reception will be held Saturday, Sept 8th from 2 to 5 PM with some geyser themed refreshments. The art reception is free. During the art reception Old Faithful Geyser of California is offering a special entrance fee of $7 per person, with children under 12 free. Julia Pozsgai will be available to share about her experience of creating geyser themed art. Visit her website at: www.pansycreations.com. To learn more about the geyser, visit: www.oldfaithfulgeyser.com. Old Faithful Geyser of California is easy to find, just north of downtown Calistoga between Highway 29 and Highway 128 at 1299 Tubbs Lane. Julia Pozsgai ties for 3rd place out of 42 entries at the 2018 Sonoma Community Center's Trashion Fashion! Her Geyser gown design was fashioned out of 500 recycled clear plastic bottles cut to form spirals. These were layered onto a long cream-colored vintage sheath by Joseph Magnin and sewn on with dental floss. Julia Pozsgai was one of the Arts Guild of Sonoma artists to paint a wine box which then became one of the awards given out at the film festival. Her box was chosen to be presented for the Best Animated Short film. The film which won was titled "Two Balloons" directed by Mark C. Smith. Enjoy viewing the delightful art expressions of Julia Pozsgai at the Arts Guild of Sonoma during the month of February! The Arts Guild is located at 140 East Napa Street, Sonoma, CA. Gallery Hours are: Thurs - Sat 10 - 6 and Sun- Mon 11 - 5. (Closed Tues and Wed). An opening reception will be held on February 2nd from 5 to 7 p.m. Come visit with the artist and celebrate with her. Come see my new artworks at the Nature and Optics Festival! It is located at 20 E Spain, next the the historic barracks near the downtown Plaza in Sonoma! I will be showing some of my paper mache sculptures, new paintings, and prints and fiber arts and copper jewelry. This is one of my favorite events to participate in because of the many different nature agencies and live birds and animals to experience. I have some new art explorations I also want to share with you. Please stop by my art booth and tell all your friends to come too. Julia in Arts Guild of Sonoma! I was recently juried into the Arts Guild of Sonoma to begin showing in July. The gallery is located at 140 E Napa Street in the town of Sonoma, CA, a half block from the downtown square. The Arts Guild is one of the longest running art collectives in the state of California. They are celebrating their 40th year this year. It is great to become part of the Sonoma Art community and is a wonderful advancement for me. I am thrilled to have the chance to present in a professional gallery. Some people describe my art works as having a whimsical yet graphic painting style to capture my subject matter with a simple essence and patterning. I enjoy the fun and color of painting! I also have some of my copper metalwork of wishing vessels and a copper (precious metal clay) leaf bowl along with leaf earrings, necklace and bracelets with the leaf theme. You can also view many of my matted art prints available for sale there as well. This show is on display through Aug 28th. There will be a break in September during the special "Call to Artist" show and then I will be back showing in October. Please visit the gallery which is open 6 days a week from 11 to 5 daily except Tuesday. Extended hours are on Fridays and Saturdays when they stay open until 6 p.m.
Come see the new art work I have made with paintings using multi-media, new copper artistry, and some paper mache sculptures! Please come to my opening on June 3rd from 4 to 7 at the Alchemia Art gallery located at 111 Kentucky St., in Petaluma, CA. I appreciate your support for my art and hope you can support me by purchasing some of my creations! Come view a few of my bird paintings (small size) on display at the Petaluma Pie Company located at 124 Petaluma Blvd N., in the town of Petaluma, CA..
Julia will exhibit her "Birds in Nature" quilt at the annual Vintage House Quilt Show in Sonoma. Julia will exhibit her "Birds in Nature" quilt at the annual Vintage House Quilt Show in Sonoma. Julia got inspired to create this quilt from the Audubon Society of Marin. She captures the essence of the birds in the applique style she uses in sewing. It's as if she is painting with fabric. The show is held Saturday, March 25 and Sunday, March 26th and will feature the beautiful quilts of many talented local artists. Call 9707) 996-0311 for more information. Julia participates in Trashion Fashion event! Julia Pozsgai designed a winter outfit and scene for Barbie in Antartica! Julia's entry is on display from Saturday, March 18th through Sunday, March 26th in Gallery 212 at the Sonoma Community Center. Visitors can bid on their favorite Barbie and help raise funds for the Community center. Sonoma Comunity Center is located at 276 East Napa Street in Sonoma, CA. Admission to the show is $1. Julia Pozsgai is pleased to announce several of her paintings were successfully juried in for marketing and licensing by ArtLifting, Inc., an online gallery and national art dealer with Northern California operations headquartered in San Francisco. The ArtLifting organizational structure is one of the new, for-profit, public benefit corporations. Their business model includes marketing original and reproduction art to businesses across the country for use in their offices. ArtLifting represents only artists with disabilities, or who are homeless. On November 16th, Julia had an opportunity to see the exhibition at Gensler with her painting mentor, Suzanne Phillips and her Art Business support person, Gina Roman. Julia also participated, along with 6 or 7 other artists, in expressing the challenges and difficulties they are overcoming through their artistic expression. Julia’s autism is her catalyst to create. ArtLifting maintains an international online gallery of all their artist’s works and licensed reproduction products. (www.artlifting.com). The artist’s original works, available products, and biographies are professionally presented, with easy online purchasing options. Julia’s ArtLifting webpage is: http://www.artlifting.com/collections/julia-pozsgai. Imagine a World art show! Come enjoy the art show all of August and come celebrate with Julia at her opening reception, August 5th from 4 to 7 p.m.
Dec 11th ~ Join Us For an Evening of Art & Joy at Studio 35! Come enjoy Julia's exhibit at Studio 35 and celebrate her business success with her! You will be awe struck by her new innovative series of abstract paintings and skillfully hand made precious metal jewelry! Her nearby studio will also be open during and after the party for those who'd like to see her full collection of recent works and shop for one of a kind holiday gifts! Thursday October 8th at the McClellan Airforce Base in Sacramento, CA. Saturday December 20th and Sunday December 21st located at The Craneway Pavillion (1414 Harbour Way S, Richmond, CA 94804). Sales are from 10 am -5 pm both days. This will be a great place to get one-of-a-kind, heart-felt holiday gifts! Click the link below to read an article about Julia's artistic endeavors that made the news!